Amazon is back again with its exciting Amazon App Treasure Hunt. This time its revamped with more loot on Electronic products. The Offer will be available exclusively for mobile App users on 8th September from 11 am to 7 pm. This time, Rupee 1 deals would bring more fun to the App treasure hunt. For people who are unaware of the Treasure hunt, it’s a game of Finding the Answer using a clue. 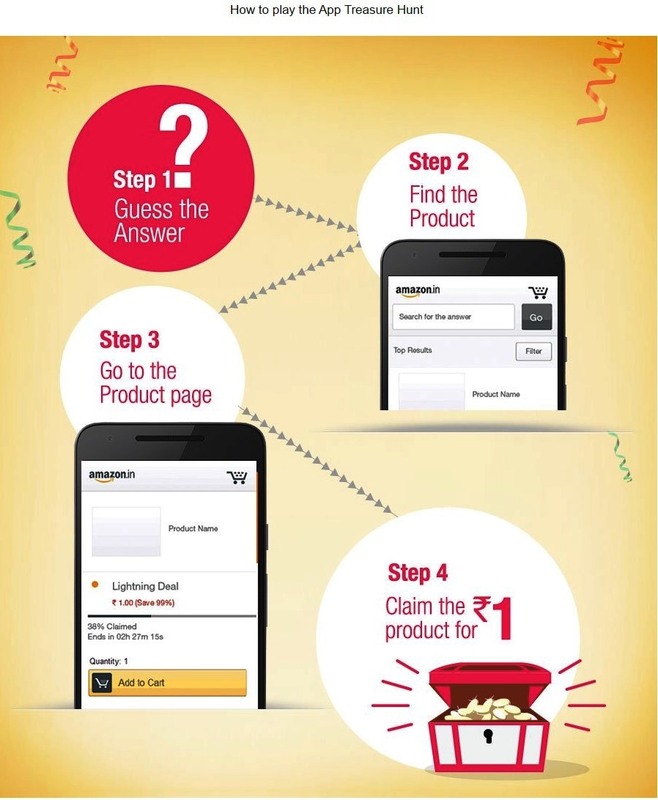 Amazon would display a clue to a product listed on mobile app and whoever answers the question will given a chance to grab the electronic product for very less cost 1 rupee. Only limited number of lucky customers can avail this offer, and it follows the first come first serve process.The offer lasts until stocks for such Product available at the promotional prices. The first clue will be shown on 11 am on September 8th, which follow other clues for every half and hour. There are some websites which would provide answers to those questions. Each participant can purchase a single Product once for each clue during the Promotion Period.He or she cannot apply any other coupons or codes in an order which is ordered on this Promotional offer. Amazon had started this treasure hunt offer as a part of their development strategy which proved to be successful. This time, the offer is only confined to Electronics Products. Note: Standard shipping charges, applicable taxes, COD (Cash On Delivery) shall apply to any purchase made by eligible participants under this Promotion.